Just one day after the vacation started, we went to Dirab. It is a place in Riyadh which is really worth seeing and is a 30 minute drive. We can see many valleys in Dirab. It was mid-morning when we went there and then we wished we had thought of the time more clearly because Dirab looks best in the evening. When the sun’s rays shine through the mountains in the colorful evening sky during sun set, it looks just great. The sun’s rays on touching the clouds reflect the clouds with a bright golden colour. The blue sky is transformed into pink, purple and golden. 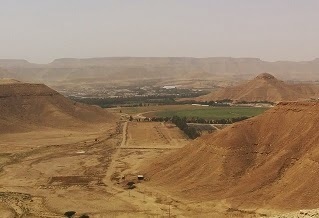 There are farmlands and a horse stable at Dirab. From a distance the valleys look beautiful. My Mom loves Dirab a lot. She always insists on going there since it is such a relaxing destination. Since the valleys are low, every time we go on the hairpin road downwards, my ears pop. Thankfully it goes just as quickly. My ears pop in flights and they begin to hurt a lot. The foggy hearing that I get only goes after a while. Every time we go to the valleys, my Mom and I eagerly turn our heads to the stable side when it comes to passing that area. Sometimes we can see the brown, white and black horses, walking around in the field or being driven. Once we saw the sunset in Dirab and it looked really magical. We felt very excited as we had never seen such a beautiful sun set. On seeing it, I wondered how artists would make the right combination of colors in their paintings, because the sky was a mixture of colors.